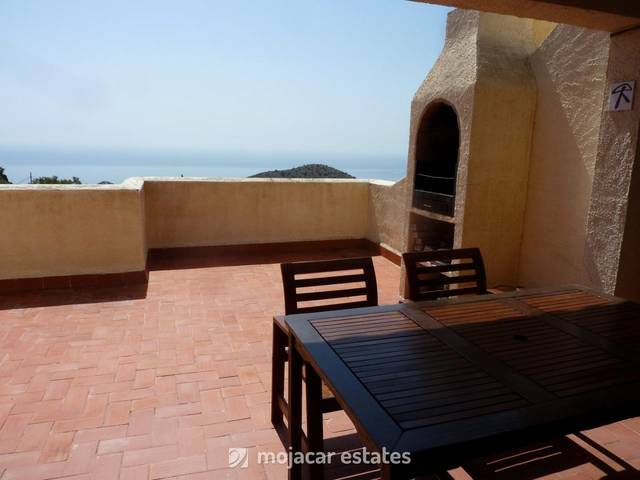 Lovely decorated apartment for 4 people in sea frontline position with direct sea views in Mojácar Playa very centrally located within easy walking distance to shops and amenities in community with pool. This accommodation is on the groundfloor where the swimming pool is and comprises fully equipped kitchen, oven, fridge-freezer and all kitchen utensils and separate laundry room with washing machine. There is a bedroom with double bed with ensuite bathroom and access to front terrace, 2nd bathroom with shower cabin and 2nd bedroom with 2 single beds. The lounge has a dining area, Spanish and Astra TV, music stereo and has patio doors leading out to terrace. Air conditioning in the living room and ceiling fans in the bedrooms. Underground garage space and community pool. Frontline apartment with excellent sea views close to shops and amenities.